Dyer’s broom is a perennial herbaceous shrub; grows 1-2 feet high, the stems are woody, slightly hairy, and branched. The alternate, nearly sessile leaves are glabrous and lanceolate. Golden-yellow flowers grow in narrow panicles from June to August. The fruit is a long, shiny pod shaped like a green-bean pod. Grows in dry uplands from Maine to Massachusetts and in eastern New York, also in meadows, pastures, and woods in Europe. Woadwaxen was used by the ancient Britons for yellow dye. There is another plant called Woad (Isatis tinctoria) of the cruciferae genus is also a dye plant. Woad is cultivated in Britain for the blue dye from the leaves. 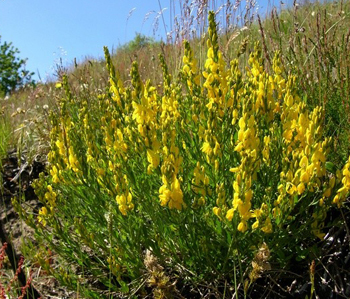 Dyer’s broom tea acts as a mild purgative and has been recommended for gravel and stones. It stimulates the central nervous system (compared to that of nicotine). Dyer’s broom raises blood pressure by constricting the blood vessels and should be avoided when hypertension is present. The tincture of extract is used externally for herpes or tetters. Infusion: steep 2 tsp. flowering twigs in 1/2 cup water. Take no more than 1 cup per day. Dyer’s broom raises blood pressure by constricting the blood vessels and should be avoided when hypertension is present.